There’s some days when I’m reading the bible and it just says to me – Boom! One of my professors used to talk about that sometimes when we really believe, I mean, really believe what we can do, or better said, what God can do through us, we will be so fired up that we will want to charge hell with a water pistol. 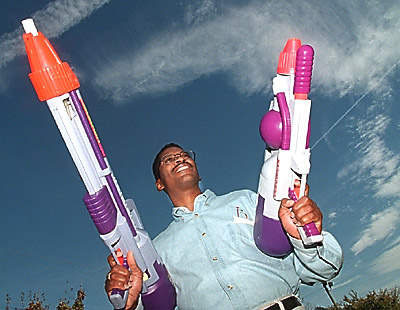 The odds may look long, but we know that with God on our side, me, you, a super-soaker, and God can defeat the power of Hell. Today’s passage did that for me. And when they could not find them, they dragged Jason and some of the brothers before the city authorities, shouting, These men who have turned the world upside down have come here also, and Jason has received them, and they are all acting against the decrees of Caesar, saying that there is another king, Jesus. They dragged the disciples before the leaders and said – these are the ones that have turned the world upside down. Come on now. That’s it right there. Don’t you want them to say about us, those are the ones that have turned the world upside down. They have this King Jesus, that they follow and the change the world. They help heal broken families. They love the unloveable. They help the poor. They feed the hungry. They proclaim the freedom that is found in no other name but Jesus. They are crazy enough to think that they can change the world. They have turned the world upside down. Through following Jesus, through His power and life, through proclaiming the gospel, so can we! It doesn’t have to be the same. It can change. We can change. The world can change. Through Christ and His power, we can turn this world upside down. We can do it. Today. Through His power. Let’s turn the world upside down. Jesus told us that the gates of will not triumph against His church. Let’s charge hell with a water pistol today. Today, through Christ, we can do it!